This series of classes is designed for both emerging energy healers, and anyone interested in learning more about chakras and their own energy field and systems. This class is also a requirement for entry into the Blue Star Monastery. You will learn about the chakras in a way that draws in real world experiences, in explainable terms to help those who are new to working with chakras to have a better understanding, as well as to broaden and deepen the wisdom of those who are already engaged in working with energy medicine. This far exceeds book learning and brings us into the world of intuition and channeling, as well as a metaphysical activation of each chakra as we work with their energies. The activation of the chakras will prepare you for higher learning and greater receptivity and grounding of mystery teachngs. We will discuss the powers and concerns of each energy center, and will focus on a different chakra in each session starting with the root chakra. There will be 7 classes in this series. You may join in at anytime and should complete the series once all 7 chakras are complete. 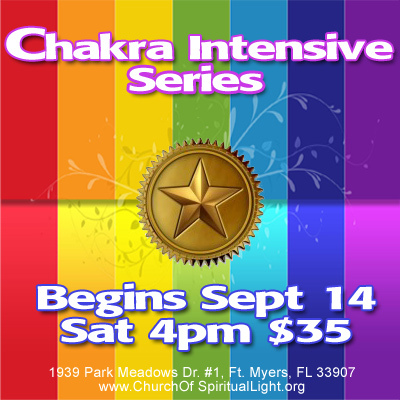 The class will be ran perpetually so that you will have the opportunity to learn about and work with each chakra. Each class is open to the public. You will learn how to work with a pendulum and affirmations to attune your own chakras daily, archetypes, angels as it relates to the chakra system, and much more.